Central Florida is Full of Retirement Communities. Why Live at Lake Griffin Harbor? Sure, Lake Griffin Harbor is just one of many retirement communities in Florida. But how many retirement developments in the state have a wealth of resort-style amenities as well as an incredible location on the shores of a 9,400-acre freshwater lake that is teeming with wildlife? 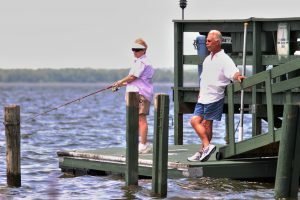 Lake Griffin Harbor is a paradise for retirees ages 55 and older, particularly those who enjoy – or think they might like to enjoy – spending time on or near a gorgeous natural body of water with others who wish to do the same. We are a professionally managed 55+ community located in peaceful Leesburg, FL, that is populated by retirees united by the common objective of staying active and having fun in an affordably priced residential setting that is specifically designed with their lifestyle goals in mind. Contact Lake Griffin Harbor today to schedule a tour of our community and learn more about why we are one of the best retirement communities in Florida.